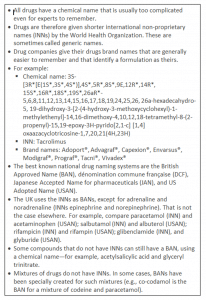 Drug names are difficult to remember, pronounce, and spell. For example, which of the following is the correct spelling? 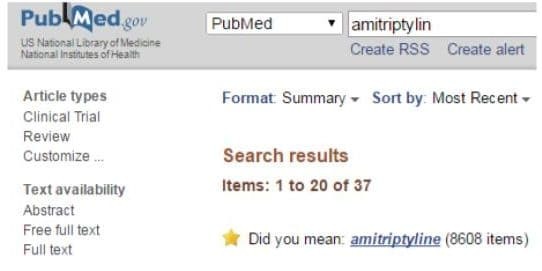 The search engine asked me if I meant “amitriptyline”, which is the correct spelling. In other words, unless you searched for the misspelling “amitriptylin” as well as the correct spelling “amitriptyline”, you would miss 14 publications. 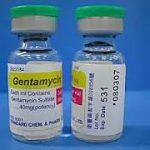 failing to search for misspellings of “gentamicin,” “amitriptyline,” “mirtazapine,” and “trazodone” missed at least 19 systematic reviews. So, if you are doing a systematic review that includes drug names, you’d better include misspellings as well as the proper ones. And you’d better include misspellings of all drug names, not just those that are commonly misspelled. Here I describe how to generate misspellings for which to search. Standard names—the international non-proprietary names (INNs), or some other nationally approved name when there is no INN. Variant names—deviations in spelling from standard names that are not themselves standard names in English language nomenclatures. Hidden reference variants—variant spellings that identify publications in searches of PubMed or other databases, but which are not identified by searches for the standard names. 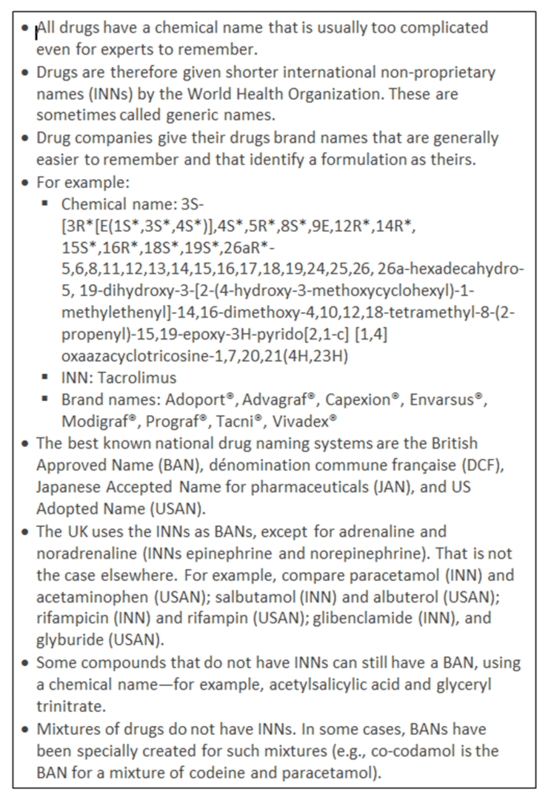 The box below tells you about International Nonproprietary Names and other types of names that drugs have, but you can skip this if you want. Other letters are much less often omitted; for example l was omitted from drug names in only 0.03% of cases and x in 0.0009%. Deduplication is a special form of omission, dealt with below (§3.5). Duplication is a special form of addition, dealt with below (§3.5). n to nn and vice versa. amitriptyline to amytriptillin (two substitutions, i to y and y to i, duplication of l, and omission of the final e); the possible combinations of changes in this name yield 31 variants—see next section. we combined all these variants. * Included one case of the variant “amitiptyline” lacking the r, and one of “amitriptyine” lacking the l. There was no variant in which the final i was replaced by a y. 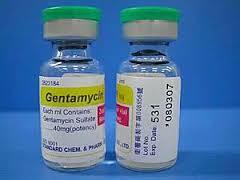 † Amitriptyline, the standard name, gave 8530 hits. Thus, there are 1572 hidden reference variants that would not be detected by searching only for the INN. You have to search using both spellings connected by OR. Again, you have to search using both spellings connected by OR to find the complete set and also search for misspellings (e.g. asprin, which gives 14 hidden reference variants). Other databases pose similar problems to those encountered in PubMed. Here are some notes on Medline. Medline allows users to search for words that are spelt with alternative letters, using the hash key # as a wild card. For example, a search for “amitriptyline.af.” yields 8092 hits. Searching for “am#tr#pt#line.af.” uncovers variant spellings with i to y substitutions (and vice versa) in amitriptyline, revealing 123 hidden reference variants. Truncation is also possible. In Medline, truncating amitriptyline at the letter l and using wild cards (“am#tr#pt#l*.af.”) uncovers variants of the last few letters (for example, ending in “-lin,” “-line,” “-llin,” or “-lline”) without sacrificing specificity, and gives further hits. However, this does not exhaust all variant forms. For example, the hidden reference variant “amitiptyline”, generated by omission of the letter r, was missed. Other errors, such as transpositions and some additions, will also be missed. The results obtained by truncation may also be limited if an error occurs early in a name. For example, searching for the variant” manitol” instead of “mannitol” yields 58 hidden variants in PubMed and Medline. However, truncating at man* yields far too many hits for a simple analysis, since so many other words begin with ma- (21975 hits in Medline for mannitol and 576489 for mann*). We have not covered brand names, but this is a reminder to search for those too. For example, searching PubMed for Lasix[tw] NOT (furosemide[tw] OR frusemide[tw]) yields 80 hidden reference variants. The following table includes variants that we have already found and others that might be found, but which at the time of writing do not have hidden variants. Information about possible additions is welcome.